﻿I have been creating & studying different arts all my life with the intention of meeting myself in a more profoundly human way. Moving to and living in San Francisco inspired me to play and create, to share my observations of social actions and how the psyche responds to humor and tragedy. I see art everywhere: in mental escapism, in the beauty of a naked body, on a street vendor, in religious symbolism, or in how a meaningless object could represent a personality type. My anonymous street installations aim to connect or expose another side of society’s paradigms with a combination of art & humor. I have interest in making interactive, whimsical and playful art as well as compassionate and empathic pieces which allow me to express pain and struggle as well as humor and banality. I am inspired by human relationships, destiny, positive thinking, love and generosity. Born in 1974 in Terrassa, Barcelona, Ana Rivero Rossi is a Spanish Artist living & working in San Francisco. She is interested in sharing observations of social actions and how the psyche responds to humor & tragedy. Her art expression often juxtaposes classical beauty in a harsh context, intending to raise awareness of the strength we must endure in order to survive in an urban environment. Ana got her art education at SF City College and was mentored in Spain by the painter Rafael Serres Asens. She has participated in several group shows as well as solo exhibitions. Her work has been featured by several publications like SF Gate, Mission Local, Vogue Magazine & El Pais. 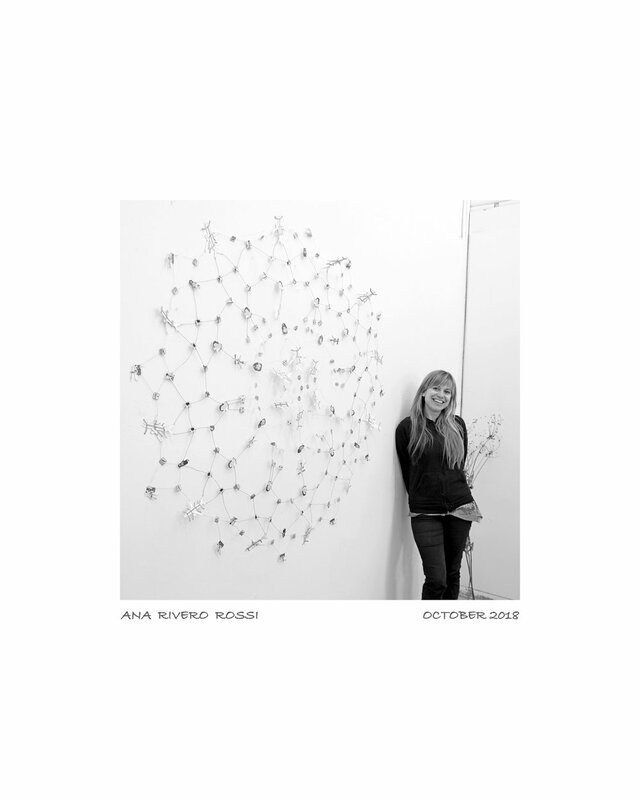 Recently she completed an Art Residency at Vermont Studio Center, Oct 2018 Alumni. 2017 Window exhibition at Ally Cat gallery. 2017 Safety Mandala, Alley Cat Gallery. 2014 Solo show, "Dating Socks", Mixed media, Window installation, ATA, San Francisco, CA. 2013 "Match (dat) sock", stencil art/public intervention in the streets of San Francisco, CA. 2012 "Aqui Love! ", public art installation on Tlf wires that travel in 18 different cities around the glove. 2010 "CA" Interactive installation made with charcoal figure drawings & magnets. SF Open Studios at art explosion, San Francisco, CA. 2007 "Contigo" Charcoal, pastel, mixed media, ATA Gallery, San Francisco, CA. 2017 Day of the Dead show, at Somarts Gallery, San Francisco. 2017 Altered Barbie Show At Back to the Picture Gallery, San Francisco. 2017 Solo Mujeres exhibition at Mission cultural center, San Francisco. 2015 My Brother, my sister, Dysfunctional family tree, mixed media/ poetry. Alley cat gallery, San Francisco, CA. 2015 Naked Ladies Show, Oil Paint at Alley Cat Gallery, San Francisco. 2009 Funk, Charcoal & pastel, Chillin production, Mezzanine, San Francisco, CA. 2009 SF Spring Open studios at Art Explosion, CA. 2008 Group Show, "Moon", Monoprint. Receiver Gallery, San Francisco, CA. 2007 SF Spring open studios at Art Explosion, CA. 2006 Love Hurts, Charcoal & mixed media, La casa del Libro, San Francisco, CA. 2003 A solas contigo, Wax & dissolvent, Arxiu Tobella, Terrassa, Barcelona.